Indonesia’s Independence Day officially began on August 17 with the upacara, or flag-raising ceremony. It was Indonesia’s 72nd birthday. The biggest upacara of them all was held in Jakarta, where students from provinces all around Indonesia marched before a national TV audience. Some local schools across the archipelago chose to start celebrations earlier in the week, and some events lasted through the weekend. English teaching assistants participated in the performances and games over the week, and no two experiences were the same. Here are some of their stories. 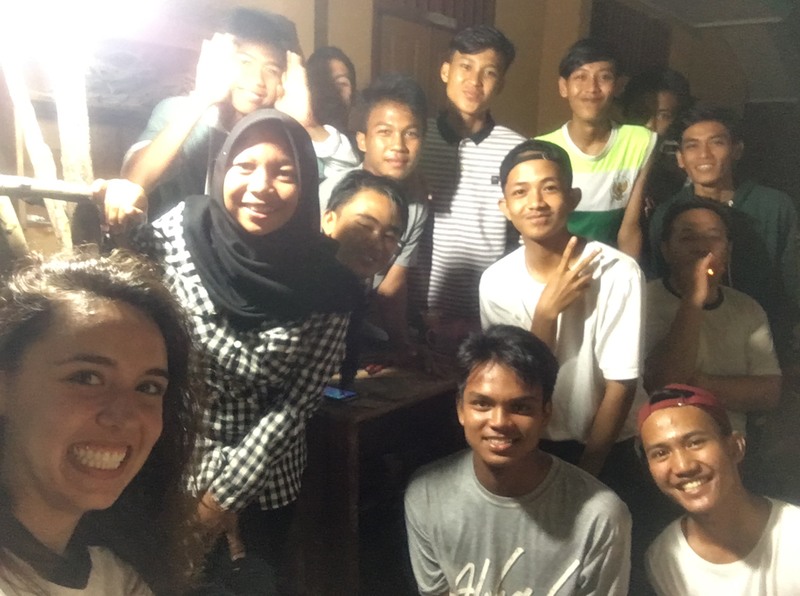 Kate Morrow – I was supposed to be teaching all week in Pangkalpinang, but as an outsider it seemed the celebrations started on Monday, August 14, and lasted until the next Monday, the 21st. After the official opening on the 17th, the rest of the day was a holiday for the entire city, yet the big celebrations only started on Saturday with powai (“the long march,” for students only). Sunday and Monday also had their own parades: carnaval (a celebratory parade with participants from all parts of the community) and a motorcycle parade, respectively. Students started building their floats for the carnaval parade a week before. Class was “in session,” but many students and teachers were busy decorating classrooms, building props for the parade, or practicing marching for powai and upacara. Tuesday night, I came back to the school, where I live, and found students and one teacher still working late into the night on their projects – a travel counter, a giant rotisserie, a set of cakes, a travel bus, and a map of Bangka Belitung. Their schedule seemed to be 7am to midnight all week, but we had plenty of time for jokes and selfies when I stopped by. Activities at SMK 3 for the last week haven’t been about curriculum or technical training for the hospitality industry. They’ve focused on community, merdeka (being independent), Bhinneka tunggal ika (Indonesia’s national slogan, “Unity in diversity”), and supporting each other. I was welcomed to help build floats, hangout with students, walk in parades, observe the upacara, and partake in a traditional meal before a dance show on the beach. While the parades and floats were part of citywide celebrations, it was only because of a friend of a friend that I was able to enjoy the dance show at Pasir Padi beach. The dance show, as told in Bangkanese beforehand (thanks to my two friends for helping to translate as it was explained! ), was a mix of traditional dance motifs with modern interpretations. The costumes were based on traditional bangkanese clothing, and the dance told the story of Bangka’s history, emphasizing its richness in resources and food and (eventually) peaceful diversity. As a dancer myself, the piece needed no translation: set against the starlit sky and the waves at high tide, the dancers wove beautifully in and out of the surf as the drum beats narrated the story. During powai, I was part of the support team who brought the students water and kept their make-up looking fresh while they marched. The 7-km march in the hot sun was exhausting. Students collapsed from the heat but returned to the march after a break in a school van that followed us. One of the teachers explained to me that teams are judged on their appearance, cleanliness, and synchronization of formations and marching. Students paid due attention to their appearance: they gathered at school in the morning to do hair and makeup, practice formations, and make sure uniforms were perfect. The girls glued on fake eyelashes while the boys ironed jackets. Later in the day, the boys and girls marched separately, but they worked together to get ready in the morning, and enjoyed a celebratory dinner together afterwards. Students prepare to line up for the long march with one final huddle. 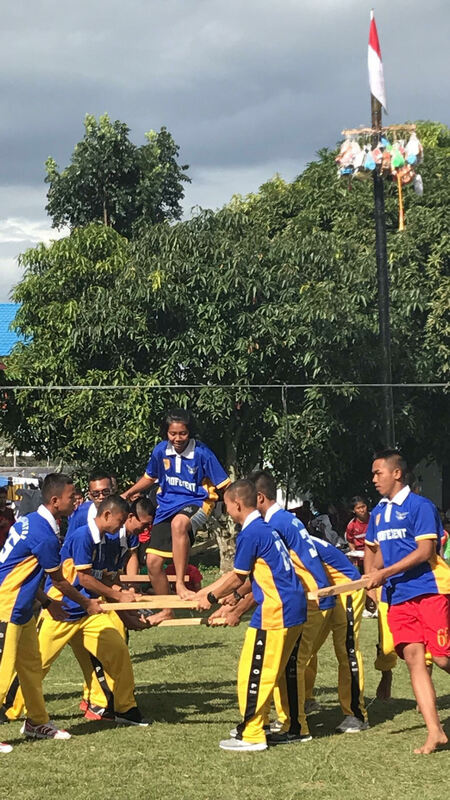 In tug-of-war games at several schools, students and teachers competed against each other. Often it was clear who the winners would be. Elena Dietz at her school in Malang. 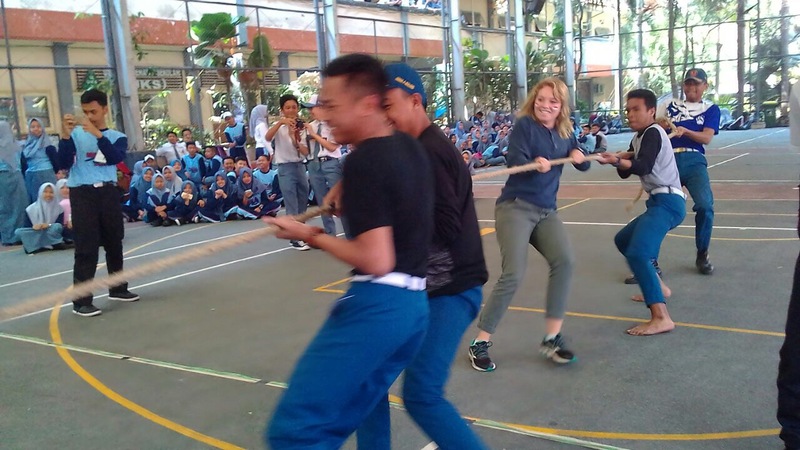 After attending the parade in Balige, Amy Quirion continued celebrations with her school and students by playing games and enjoying good food. Ian Morse – Villages outside Gorontalo opened and closed Independence Day with the upacara. The highlight of the day, though, were the dozens of marching squads that competed for best in the district. 45 teams competed, to mirror the year Indonesia gained its independence, 1945. I walked with my school’s 10th grade science class team for only part of the way, but many marched several kilometers. Each gave a final show to the judges on the stage on the right of the photo below. One team in the morning, a children’s police squad, was easily my favorite because after an impressive demonstration of diligence in marching, they broke out in equally impressive dance to pop music. 45 teams of marchers lined up for the closing flag ceremony, which was incidentally also right outside my house. But in the afternoon, the most curious group to march in front of everyone was the last squad – a group of men in women’s dresses, skirts, and tutus. The whole day seemed to be just a lot of fun for everyone, with even the military inspectors goofing off on stage. Meghan Cullinan – I participated in a traditional parade or carnival, as my community referred to it, last Wednesday. The event was meant to welcome Indonesian Independence Day and included all schools in Kendari. People lined the streets cheering for the parade marchers and taking photos of my foreign self as I supported my school in the parade. 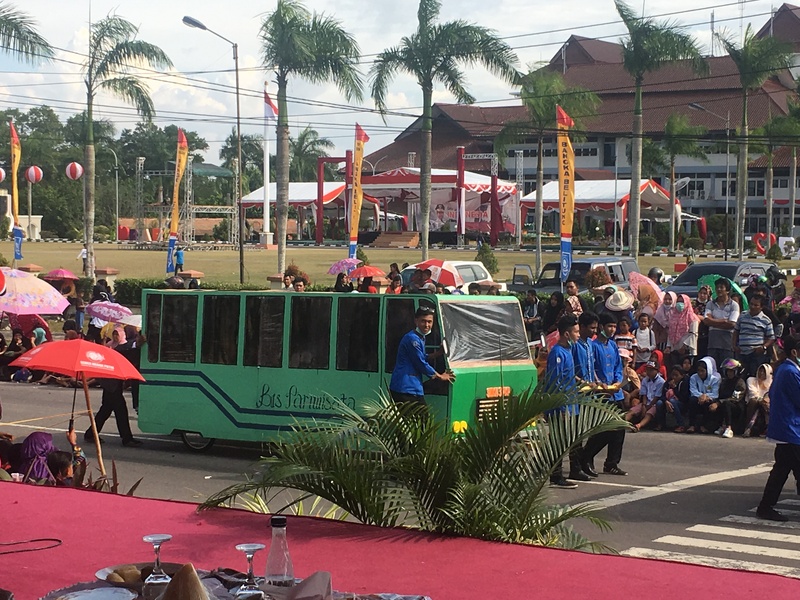 Additionally, each school performed a skit in front of the mayor of Kendari and other public officials at the end of the parade. My students performed a skit portraying the difference between the modern Dutch weapons and the Indonesian bamboo weapons. Many students got involved as nurses, doctors, and spectators in the scene they performed. In the United States, people tend to forget about the heroes and struggle behind Independence day because it occurred hundreds of years ago. For Indonesia, the revolution is still a recent part of history and as a result, it is emphasized in schools across the country. After observing my students’ passion and interest for Independence Day, I wanted to challenge them to use English to describe the events of the day. During my English club, I asked students to work together to explain a specific aspect of Independence Day in English. They discussed topics such as the heroes of the war, traditional competitions and public gatherings, and how Independence Day has changed Indonesia. After hearing their descriptions, I asked them to think about why they were proud to be Indonesian. Nationalism is certainly important, but what is even more important is the ability to express one’s decision to support one’s country. The photos show the aspects of Indonesia that resonate most with my students. It has been a wonderful experience to be able to participate in all of the festivities, history and traditions associated with Independence Day. It is not only fun to be able to connect with the students and teachers in engaging and active events, but also a unique and valuable opportunity to be able to see some of the cultural values through the eyes of our local communities. August 22, 2017 in Culture, Photography. Outstanding writing of SMKN 3 Pangkalpinang ETA, Miss Kate Morrow. Keep writing!